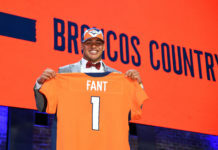 For most of the past four decades, the Denver Broncos have sat on the sidelines during the NFL’s volatile “coaching change” season, which commences the day after the regular season (dubbed “Black Monday”) ends and lasts until just after the Super Bowl or until all the coaching vacancies are filled. Yes, there was 2008, when Mike Shanahan – who’d been with Denver since 1995 – was let go and the ill-fated and short-lived Josh McDaniels era was ushered in. Fortunately, the McMistake was corrected in 2010 and John Fox has been calmly at the helm since 2011. That doesn’t mean Denver hasn’t been an involved observer, however. Due to the sustained success of the franchise (the McDaniels Era notwithstanding) several Broncos assistant coaches have become objects of desire among other clubs – like January 2012, when Denver lost defense coordinator Dennis Allen to Oakland, and two years ago, when offensive coordinator Mike McCoy left to take over in San Diego. 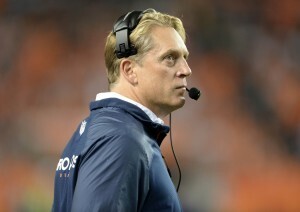 The current coaching change season is offering more of the same, with Broncos offensive coordinator Adam Gase reportedly interviewing with four other NFL teams – San Francisco, Atlanta, Chicago and Buffalo – during the team’s bye week, while defensive coordinator Jack Del Rio was being quizzed by the Oakland Raiders – as was former Broncos head man Mike Shanahan. Yes, the same Mike Shanahan who long viewed the Raiders organization the same way most Americans view the Taliban, was reportedly willing to at least visit with the Dark Side. Unemployment makes strange bedfellows. On one hand, it’s nice to have stability in your coaching ranks. It would be helpful to keep your assistants from season to season for the sake of continuity. On the other hand, it’s a compliment when other teams come after your assistants. Plus, no franchise wants to keep their guys from advancing – at least when the time is right. Is the time right for Gase and/or Del Rio? Broncos fans certainly hope that both men have their focus squarely on finishing this season, with a Super Bowl title on their minds. After that, each has to do what’s best for him and his career. So there is no set answer. It really is a coin flip. McCoy – who had never previously been a head coach – is doing just fine in San Diego. He has been in the NFL since 2000 as an assistant for both Carolina and Denver before the Chargers made him the head man in 2013. But Allen – also never a head coach before – lasted less than three seasons, 36 games (8-28) to be exact, before getting a pink slip from the silver and black. Which brings us to McCoy’s successor in Denver, Gase. Far less experienced in terms of years spent on the sidelines, he started his career in 2005 as an offensive assistant in Detroit, spent a year with the 49ers and is finishing up his third season in Denver (two as OC.) Gase is just 36 years old, has never been a head coach. This means as a newbie, he’s every bit as likely to flame out like Allen did as he is to succeed like McCoy has. There is a lot more to being a head coach than just knowing how to plot out an offensive game plan (done with a lot of input from a certain future Hall of Fame quarterback.) Successful head coaches are excellent leaders, CEOs – the kind of men others want to follow. They have to be football smart and people savvy. There is absolutely no way to yet know if Gase – who is younger than some of the men he’d be coaching – will be that kind of leader. On the flip side, Del Rio has already been an NFL head coach, so with past and current successes on his résumé he seems like an ideal candidate for many openings. It’s odd that the unproven Gase is more highly sought after. Throw in the fact that Fox won’t be coaching in Denver forever and a replacement for him will be needed at some point, and both men have a lot to think about. Should I stay or should I go? There are unquestionably good and bad NFL head coaching jobs. The San Francisco job looks like a great opportunity for whoever lands it, but the break up with Jim Harbaugh has raised red flags about the organization. Buffalo has a good defense to build around and Atlanta has some offensive talent to work with, but both are suspect in the front office. Chicago still has the Jay Cutler mess to figure out. Basically, no head coach can succeed if there is not solid work being done by the administration. It stands to reason that most openings occur because things haven’t been going quite right with the previous regime. 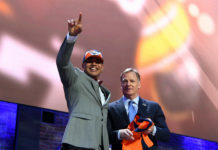 Do either of Denver’s successful coordinators want to leave behind great jobs with a top-flight organization to take a flier on one that’s been scuffling? For that reason, Del Rio would be making a giant-sized mistake to take the Oakland job, presuming it’s offered. He’s the most likely to replace Fox here, having already done so on an interim basis. The Raiders gig is a career killer, a failure waiting to happen. There will be better opportunities available for him.